Why are police departments understaffed? For many reasons, it is increasingly difficult to staff police departments despite the best efforts of recruiters. As a result, "beat" officers must prioritize 911 calls over routine patrols, and demand on police services can pull officers into other beats. Additionally, our courts and jails are clogged, and non-violent crime like burglary doesn’t receive significant (if any) jail time. These news reports explain why it is so hard to staff police departments. Clearly, these circumstances mean that we cannot always expect our police departments to rapidly respond to a call about a theft that occurred overnight, a strange vehicle parked in front of our house, etc. 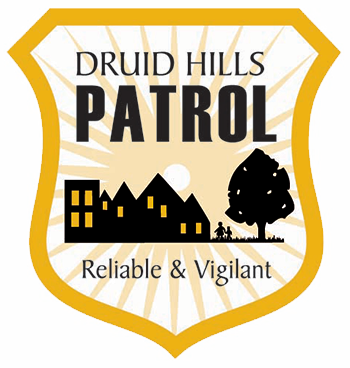 However, we CAN expect a rapid response from the Druid Hills Patrol officers during the hours they provide the much-needed patrolling. Our officers’ ONLY assignment is to deter crime in the coverage area and monitor police radio for emergencies IN DRUID HILLS. When they are already patrolling the neighborhood, they usually respond faster than DKPD or APD officers. This is why police department leaders emphasize that our common safety requires a comprehensive approach that includes the Atlanta and DeKalb County Police Departments, the Druid Hills Patrol, neighborhood watches, and increased physical security of our homes (locks, security systems, lighting, fences, and cameras).